About a week in, the epic story of hurricane Harvey is still unfolding. Compelling video footage of human decency and nature’s violent fury are at the same time both uplifting and disturbing. 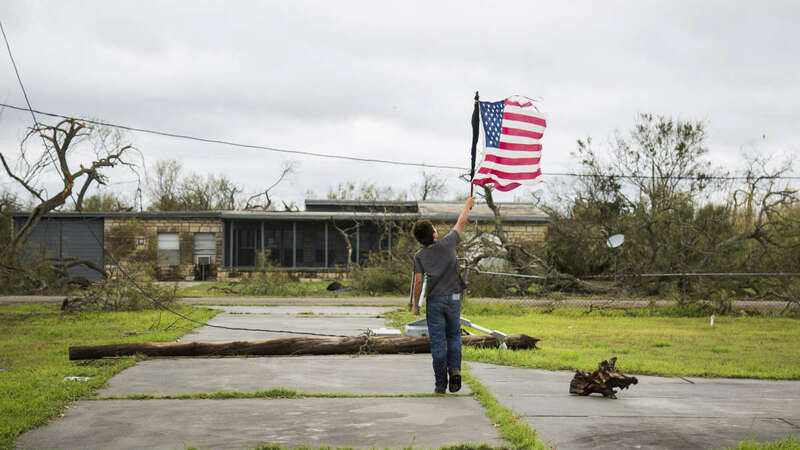 No matter what else happens and no matter how devastating the damage, I am confidant that the American Spirit is alive and thriving. We as a nation will come out of hurricane Harvey better than we went in. I just know it. In more practical matters, this is a good time for all radio amateurs to give themselves a reality check and take stock of their resources. If a major disaster hit right now and the only form of communication was amateur radio, would you be able to put an effective signal on the air? No one can genuinely prepare for every possible calamity, and the definition of an “effective signal” varies considerably. As much as my Off Grid Ham articles stress organization and planning, about 90% of being prepared is accepting that you don’t exactly know what is coming or when. And as hurricane Harvey exemplifies, having the best equipment and the most careful plan doesn’t matter if everything you own is under water. There is no plan against several feet of rain and 100+ mph winds other than to run for your life. What you can –and should– do right now. A famous radio talk show host once quipped, “hope is just disappointment delayed”. I’ll add to that: Hope is not a plan. If you have no means to operate off grid amateur radio, then get your rear end moving and come up with something. It does not need to be elaborate or expensive. Do the best you can with what you have. Even a $29.00 VHF/UHF handheld radio and way to charge the battery without commercial power will be a huge advantage when SHTF. Being prepared is similar to gambling: You know you can’t cover all the possibilities, so go for the ones that are most likely. Don’t ignore the obvious out of worry for the obscure. I was once asked how to set up an doomsday off grid amateur radio station with a range of 650 miles by someone who did not even have a working fire extinguisher in their home! What do you think is more plausible: A cataclysm event that wipes out functioning society, or a kitchen fire? It’s important to point out that in most disasters, the public communications networks are not disabled long term. As bad as hurricane Harvey was, the outages were highly localized. 911 (mostly) worked; whether or not emergency crews could respond is a different matter. Many residents live-streamed the storm on social media and gave phone interviews to cable news networks as hurricane Harvey raged outside and water filled their homes. Still, believing the system will always come through when disaster hits is also a form of gambling, and I don’t mean in a fun get rich quick way. Having a backup plan that does not depend on the grid is a much safer bet. This Off Grid Ham article from July 2016 explains the public communications network in more detail. The other important preparation is regularly practicing and training with your off grid amateur radio gear. At minimum, a few times a year make sure everything works, make sure all the accessories are in place, and charge the battery. Check programming and presets and change them as needed. Other needs should be addressed ahead of time, too: Food, water, security, medical supplies, etc. Off Grid Ham is not per se a survivalist/prepper website, nor am I an authority on the topic, so we won’t be discussing SHTF survival in detail here. I do completely agree with the survivalist/prepper mindset and understand where they are coming from. There are plenty of credible resources on the web for those who want to learn. The remarkable but unsurprising silence. Off Grid Ham readers get it. I’m assuming that by virtue of reading this website you all accept on some level the need to be prepared. It’s everyone else, the ones who think “being prepared” means changing the battery in the smoke detector once a year, who should be concerned but probably aren’t. You don’t want to be “everyone else”. Hurricane Harvey, right here on American shores, unfolds before them on TV and yet they still think disasters happen to other people in faraway places. Mother Nature’s real-world cautionary tale is totally lost on them. If you are safe and dry in a comfortable home, take a moment to offer humble gratitude for the abundant blessings you have received and pray that your not so fortunate neighbors and fellow Americans bounce back soon. Then go make preparations today, however small, to improve your odds of survival when some version of hurricane Harvey comes kicking through your door. Still, it is concerning how few people are prepared for any kind of emergency. Especially when it doesn’t take much to make at least minimal preparations. At the very least they should have enough food and water to carry them over for a few days, plus clothing to deal with the climate, first aid supplies, etc. Even we have issues. With us it’s water. We try to keep bottled water on hand, but it keeps disappearing. Someone snags a bottle or two to take along in the car and it never gets replaced… Always something, I guess. Hurricane Harvey won’t be the last. Global climate change with the oceans warming means more 100 year events will occur. Two years ago we had a 100 year event. Here on the CostAllegre on the Pacific coast south of Puerto Vallarta we looked at Patricia, an approaching hurricane with winds that exceeded anything ever recorded on earth, 320kmph. A Cat 5+ if there is such a thing. We had plywood on the windows but that evening I looked to the south. where the sky looked like something out of an Armageddon movie. The air was still but the lightning dancing in the clouds and into the sea was awesome, and becoming increasingly frightening. I knew we were ‘in for it’. The big savior was as I said to mi Susy, in Spanish “lets get the hell outta here.” I fortunately had plenty of gas in my car to get to Guadalajara as there are no Pemex gas stations within 40km of here. That was the key, keeping your gas tank at least 1/2 full, my car a VW can easily go the distance to safety on half a tank. As the storm, slightly reduced to 260kmph crossed the coast in the early morning we kept in touch with folks until TelCel service eventually went out, which lasted a surprisingly long time. They said stuff was flying everywhere… a panel truck blown over. The eye passed 25km to the south of my home. I can promise you, no ham beam and no tower, nor no wire dipole could have ever survived that storm, no way. I took down my Ubiquiti Powerbeam dish, and laid the mast on the flat roof so it was safe. The storm passed quickly that morning, maybe 2 hours. That evening returning to Punta Perula I witnessed an awesome turnout of emergency resources. CFE the national electricity commission had mobilized massive resources to deal with the aftermath of the storm. Lots of Telcel and Telmex trucks too. Lines miles long of CFE bucket trucks galore were driving down the freeway to the coast. So much debris on the highway they had to chainsaw a 1 lane path through the broken trees bushes on MEX 200. There were flatbeds of equipment, transformers, rolls of wire and big 240 V gen sets. For 60 miles either of the eye passage the entire medium voltage ( I think 26kv and 13kv distribution grid was on the ground, a tangled mess, but most of the 500kv backbone was still OK with only two towers down to my knowledge. We arrived home less than 8 hours from the storms passage to find half the town completely lit up with 240V generators.. By morning there was one growling away outside my back door, noisy but we had power. It had Oaxaca on the name plate, a state 500km south of here. resources came from everywhere. for 2 days there was a food truck parked outside, down the street feeding hungry folks. My house? Well it’s made of concrete with lots or rebar. one broken window, the lamina’s on my breezeway were in the neighbors yard, along with my tenaca (big water tank). had a small spare one and pressed that into use the following day. Arriving at night we had no electricity until late the following morning so my little 900 watt gen set was pressed into service. Had made a ‘suicide cord’ with 2 male plugs, threw the mains breaker to the outside (and double checked with a meter) and plugged the gen set into a wall plug and the house wiring. Since all bulbs are 9 watt LED or 13 watt CFL so the entire house lit up, and yes 900 watts is more than enough to run the frig, in fact just about everything except the microwave or A/C unit. The saving grace here is that most homes are made of concrete. In an earthquake that can be bad if the place isn’t designed and properly reinforced correctly, and many are not. Water does not bother concrete or tile floors and plenty blew in during the hurricane, had about 3″ on the floor but we just swept it out again. No harm done. The repairs to the breezeway cost me about $500, that’s about all. As a final addendum some folks did lose there homes in the storm. Within a week a semi full of free roof lamina tiles was parked in town giving away laminas to people who lost their roofs, we only got a few left-overs for our breezeway as we were not priority. The government of Jalisco built a little planned community of homes, maybe 150 for folks who lost everything. It’s simple and clean,underground services provided, streets paved with cobblestones, all neat and tidy. Everyone got a frig and gas stove. Wow, that’s quite a story Richard. The main takeaway I get, from an off grid ham standpoint, is to have a portable setup because as you point out, permanently mounted antennas are not going to survive a hurricane. Even if you have a tower rated for hurricane winds, don’t count on it. Always have a backup plan…fuel, water, etc., and a plan to get out. Portables, mobiles and ‘fixed’ stations all have different range & reliability capabilities, so home/fixed stations with high power and better antennas hear and relay for the portables/mobiles. Understanding GMRS, FRS, CB, marine vhf, and HF limitations and advantages (propagation) enables solutions. Personally, I’ve participated in FRS, CB, ham, aeronautical, non-ham emergency communications, and monitored police, fire, state patrol, marine, forest, hospitals/ambulances/power & phone crews, railroad, aero tower and BLM desert operations because I was always interested in scanning, listening, and positioning. Having monitoring capabilities and an Icom 706MkIIG or similar transceiver will do alot. Programming scanners (state patrol highway cruisers have good scanners but it might take a ham to program them :-), radios, trackers, computers, radio direction finding, and reading land maps, operation manuals, and coastal charts using computer imagery with GPS and APRS, to help but not become part of a problem is an art. See you on the air or in the field for winter field day on January 27th & 28th, 2018!